Description: The man with the patch is back. Call him Snake. Kurt Russell rejoins filmmakers John Carpenter and Debra Hill to do to the Big Orange what they did to the Big Apple in Escape From New York – with even more futuristic thrills and slam-bang action! 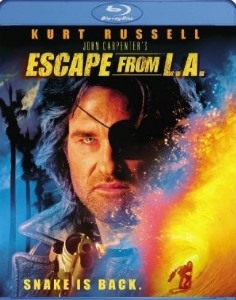 Into the 9.6-quaked Los Angeles of 2013 comes Snake Plissken (Russell). His job: wade through L.A.'s ruined landmarks to retrieve a doomsday device. Don't miss the excitement as Snake surfs Wilshire Blvd., shoots hoops at the Coliseum, dive bombs the Happy Kingdom theme park, and mixes it up with a wild assortment of friends, fiends and foes (Stacy Keach, Steve Buscemi, Peter Fonda, George Corraface, Cliff Robertson, Pam Grier and more). 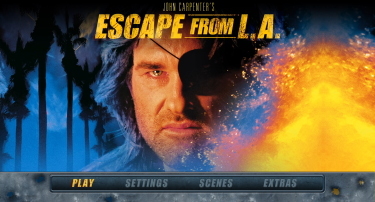 John Carpenter's ``Escape From L.A.'' is a go-for-broke action extravaganza that satirizes the genre at the same time it's exploiting it. It's a dark vision of a post-apocalyptic Los Angeles--leveled by a massive earthquake, cut off from the mainland by a flooded San Fernando Valley, and converted into a prison camp for the nation's undesirables. Against this backdrop Carpenter launches a special-effects fantasy that reaches heights so absurd that there's a giddy delight in the outrage. He generates heedlessness and joy in scenes such as the one where the hero surfs on a tsunami wave down Wilshire Boulevard and leaps onto the back of a speeding convertible. It's as if he gave himself license to dream up anything--to play without a net. This is the kind of movie ``Independence Day'' could have been if it hadn't played it safe. 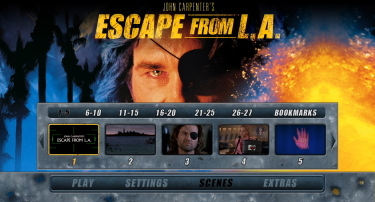 The production reunites Carpenter with actor Kurt Russell and producer Debra Hill, who also made his ``Escape From New York'' (1981). They wrote the script together (reportedly starting right after the 1994 earthquake), and it combines adventure elements with a bizarre gallery of characters and potshots at satirical targets such as plastic surgery, theme parks, agents and the imperial presidency. 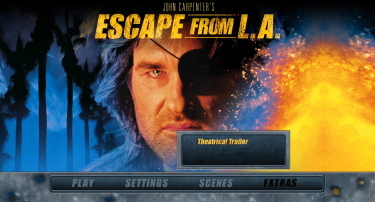 Escape from L.A. looks better than Escape From New York on Blu-ray but they are separated by 15 years and a healthier budget. Unlike its counterpart - it is dual-layered with a strong bitrate, but exceptional visuals are few and far between. The image quality shows some minor grain and it probably looked quite similar to this theatrically. It doesn't appear that anyone has bothered with DNR, or the like, and the presentation is consistent. There is some minor depth but nothing here will really knock your socks off. This Blu-ray is a decent jump over SD-DVD but doesn't really impress if comparing to more modern films transferred to 1080P. There probably isn't a lot that could be done. This Blu-ray supports a decent, if unremarkable, presentation. It's approaching 15 years ago, with a pragmatic production, so take that into consideration. I doubt it will ever look much better. 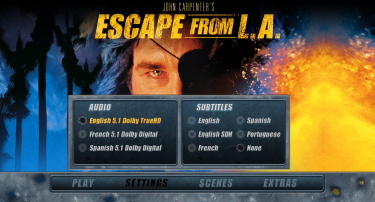 The track is a Dolby TrueHD 5.1 at 3973 kbps. It is surprisingly strong in parts - decent bass response and some reasonably crisp separations. There are plenty of action effects darting around the room. It, once again, has Carpenter's score always echoing back to the original. I like it - it suits the film to a 'T'. There are optional subtitles and my Momitsu has identified it as being a region FREE disc playable on Blu-ray machines worldwide. Nothing but a trailer. As this was essentially trying to capitalize on the niche status of Escape From New York and there isn't too much to say about it. What could be added? a commentary? I don't think so - although discussing the obviously, and occasional subtle, genre 'spoofing' could give the film it's needed boost. While I don't share Ebert's enthusiasm for this one - it is a bit of a hoot if seen on a certain level. It will never attain the cult status of Escape From New York but it's somehow comforting to know that Kurt Russell hasn't aged much in 15 years - and can he ever shoot a basketball! Carpenter actually did a great job here but the Blu-ray is, in my opinion, not worth the indulgence. If you want more of 'Snake' in 1080P - this is your only option - just don't expect the same B-charm and grassroots charisma of the original film. The lack of extras may not be a deal-breaker in many people's minds. Still, it's a tough sell at over $20.